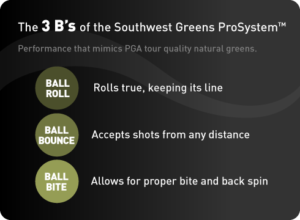 The highly acclaimed Southwest Greens ProSystem™, is the ultimate in synthetic golf greens. Engineered to truly replicate how a golf ball naturally responds on the world’s best surfaces. Championed by over 50 golf professionals. The ProSystem™ is comprehensively constructed, using several layers of differing granite substrates to form a compact and durable base. The surface is then sculpted by our world renowned golf course shapers, to create the ProSystem’s trademark contours, mounds and burrows. The final grading, considered the most tedious and skillful process, is expertly carried out by hand, to guarantee the fluid lines and perfect surface – a skill that takes several years to perfect. Our products go through rigorous R&D and testing, with direct input from SWG Construction. Our 100% vertical supply chain delivers these products in-house, culminating in producing “best on planet” products to meet the high expectations the ProSystem™ demands. The skill and artistic talent of our Master Installers take over during the construction process by taking these best on planet materials and transforming them into an installation system that exceeds the most demanding expectations. Each element in the entire process, from R&D to fabrication to design to construction is meticulously considered to ensure the 3 B’s are respected and ensured in the final installed system.